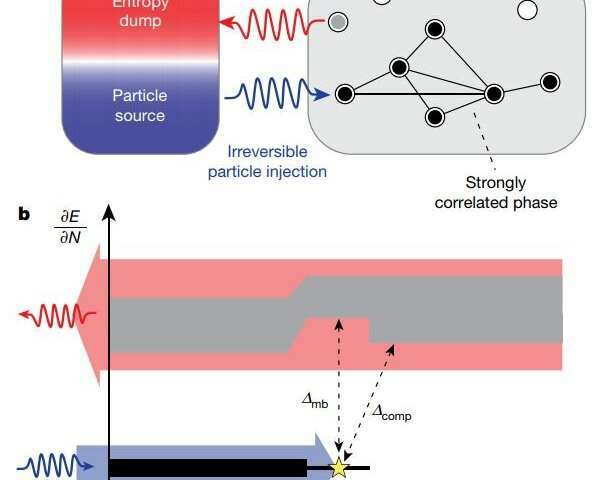 A team of researchers at the University of Chicago has developed a circuit platform for the exploration of quantum matter made of strongly interacting microwave photons. In their paper published in the journal Nature, the group outlines their platform and how it might be used. 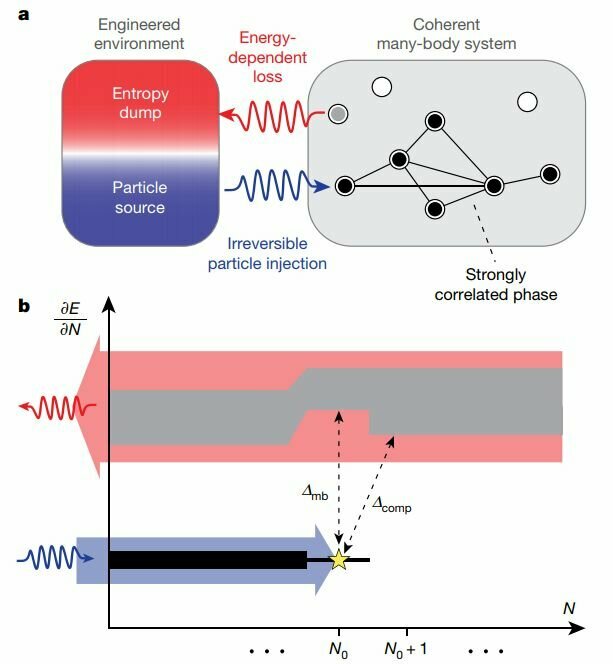 As part of the effort to create a useful quantum computer, scientists have been investigating superconducting circuits, which are controllable, have long coherence times and have strong interactions—characteristics required when studying quantum materials with microwave photons. The researchers note also that photon losses in such circuits (dissipation) can hold back the formation of many-body phases. To address this issue, they have developed a versatile circuit platform for handling many-body phases via reservoir engineering, resulting in a Mott insulator to reduce losses. The scheme involves imagining a tiny location called a transmon and considering how it could house a single photon. In such a scenario, when the transmon is empty, it is a simple matter to add a photon by pushing with a microwave generated electric field, but doing so could also remove any photon that is already housed. Instead, the researchers suggest adding a reservoir and pushing photons into the transmon as pairs—any extra photon would move naturally into the reservoir. In the case that there is already a photon in the transmon, it would remain in place rather than move to the reservoir. Next, the researchers imagined extending the scheme by adding more transmons to form a chain. An added photon would make its way down the chain, and if no locations were empty, it would wind up in the reservoir. Eventually, the system reaches a point at which all the locations in the chain are filled with single photons—this would represent a Mott insulator state. The researchers note that such a scheme would be flexible and thus could be applied to systems with different shapes, sizes and couplings. They note also that the scheme could be used to prepare any gapped phase of matter. They point out that for such a scheme to be practical, two new advances are still needed: a way to extend it to a larger system and a means of improving the quality of preparation.